Here at the Center we are fortunate to have Luis Matos, our Director of Education & Community Services. 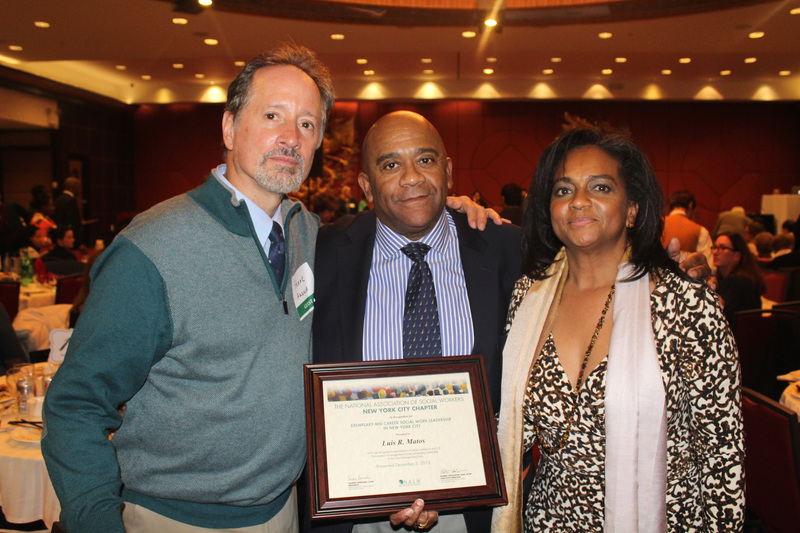 The National Association of Social Workers recognized Luis as a Mid-Career Exemplary Leader on December 3rd, at their 9th Annual Awards Dinner. Luis shared this award night with other Top and Emerging Leader recipients. Luis Matos (middle), sister – Lydia and friend – Frank. We applaud Luis for cultivating a society free from violence and abuse through education and intervention. Since Luis has led the ECS utilization, our community-based case management services have tripled. ECS facilitates supports groups for Spanish speaking women, English speaking women and children affected by domestic violence. Luis develops and coordinates CADV’s internal staff training and provides or trains others to provide training in the community. He is committed to developing the next generation of social workers, through supervision and mentoring. Congratulations Luis for this well-deserved award! !